The SEC has long been hinting at an increase in its validation requirements for XBRL filings, and it seems that they have finally begun the process with the recent release of the 2014 Taxonomy. With no advance notice, the SEC introduced a new validation error* that immediately caused XBRL exhibits to be stripped from some live filings. These sorts of unannounced validation issues can cause unnecessary grief and unsightly Amended Filings. We can help. Since the beta-testing phase of the XBRL mandate, RDG Filings has been constantly increasing its knowledge and expertise, and there are two ways we can improve the quality of your XBRL code and avoid future validation errors. If you are currently getting your XBRL done by an outsource provider, please contact RDG for information about our Full Service XBRL solution. With RDG, you will have access to a dedicated account manager, who is a CPA and will work directly with you throughout every filing deadline. 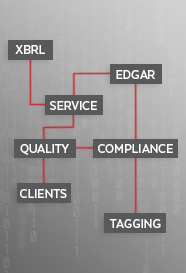 The XBRL code we file for our clients is of the highest quality. Alternatively, we can provide you with an independent, 3rd party review of your XBRL code. RDG’s Quality Assurance team of expert CPAs will ensure that your XBRL is not simply SEC Compliant, but that it satisfies the most up-to-date and strictest recommendations from the FASB, the AICPA, and the XBRL.US. Many companies who create their XBRL using in-house software (or who have it built by the software company) desire a higher degree of confidence that their XBRL code will not raise flags with the SEC and will be most usable to analysts and investors. RDG Filings’ XBRL Quality Assurance Experts will ensure your taxonomy is accurately updated, and they will thoroughly review your XBRL code to bring it in line with the strictest standards available. We would like the opportunity to present these services to you in the near future. Please contact us for more information and a quote, or to set up a time to discuss the options available to you from RDG Filings. The Limited Liability period is long over, and the SEC has rolled out three new fraud detection initiatives all made possible by the RoboCop automated enforcement tool that will automatically trawl through XBRL filings immediately upon filing. RDG Filings has the knowledge, expertise, and experience to ensure that the AQM-RoboCop tool being deployed daily by the SEC is far less likely to flag your XBRL filings. *FYI: The new validation is: Nonnnumeric Concept Must Be Duration. It means that an extended concept must have a Period Type of ‘duration’ because its base type is not numeric. In other words, when tagging a date as a fact or a time period, the SEC wants you to apply a start and end date to the date. It’s an odd validation that does not make a huge amount of sense, as there are cases when one may prefer to tag these types of concepts as ‘instants’. Regardless, now you cannot do so.